SAN MATEO LIVING. Living in San Mateo Rizal was beyond my thoughts. Before I got married, I preferred to have my future family make our home in Quezon City where I have lived since birth. Then one day after twenty four years, I made a decision to become a full-time resident of San Mateo. It’s true that I miss the many things about living near malls, gimmick places and other urban conveniences. But every time I go to work in Makati or visit my relatives and old friends in Quezon City there is always this excitement when I come home everyday to our humble abode in San Mateo. So allow me to show you around my hometown. GENERAL LUNA HIGHWAY. In terms of geography, the town of San Mateo is just a heartbeat away from Metro Manila. Barangay Banaba is its gateway, whether approaching it from either Nangka in Marikina City or Batasan Road in Quezon City. Upon driving through the arch above General Luna Highway marking the entry point to San Mateo, a marker can be seen by the side of the road saying something like you are now leaving the National Capital Region! General Luna Highway is San Mateo’s main thoroughfare. 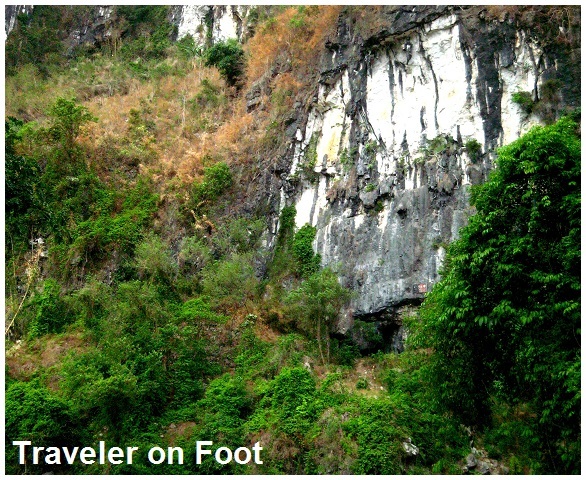 It must be a historic road where Andres Bonifacio could have passed by on his way to Pamitinan Cave. The legendary General Licerio Geronimo and his band of tiradores could have marched this road on their way to the victorious Battle of San Mateo. ACACIA TREES. Several decades ago, old timers claim that the interlacing branches of enormous acacia trees rising from both sides of the road provide a living ceiling to passers-by. One that was said to be inhabited by a cafre or ogre was torn down recently to give way for a parking space of a newly constructed building next to San Jose de Ampid Parish. The poor cafre must have been satisfied of just being a housemate in one of the buildings in the area. One of the largest surviving trees still stands along the highway in Barangay Ampid near the corner before entering Ciudad Christhia Resort. CIUDAD CHRISTHIA. After Banaba is Barangay Ampid. Ampid is home to a popular summer destination -Ciudad Christhia Resort. But even during none-summer months, the resort seemed to be on peak season. I have seen from our balcon truck loads of tourists making their way to the resort everyday (and every night). Perhaps they are drawn by its “nine-waves pool” and acrophobic double-loop water slide. We have been to Ciudad Christhia several times. Big and brawny, it has three large pools (the main pool can simulate rippling waves), 66 air-conditioned cabanas, complete sports facility, including a 12-lane Duckpin Bowling, billiards and tennis tables and basketball court, a butterfly farm and greenhouse for the kids and karaoke lounge for the adults. KAKANIN AND PRIMABLEND. Exploring further into the town, urban icons continue to manifest their power. Sure one can have a Jollibee sundae or a Chowking halo-halo in the plaza, but San Mateo prefers the home-made kakanin or different varieties of delicious rice cakes sold in the Guitnang Bayan market or the delectable pastries and the mouthwatering butter-rich cakes whipped only by Primablend. Primablend has a branch along General Luna, a few walks from the plaza. The bakeshop has become an institution in San Mateo. I’ve sampled their cakes once and since then I’ve developed a craving. Every September, Guitnang Bayan celebrates the Kakanin Festival in praise for this delicious delicacy where bilaos of kakanin are paraded and shared in a feast for everyone. Although the town has rapidly developed into a first class municipality (whatever that means), local flavor and folk traditions that are nostalgically provincial managed to survive. SPANISH SAN MATEO. During Holy Week, Spanish San Mateo comes alive with its almost daily processions at San Jose de Ampid Parish and at the centuries-old Church of Nuestra Señora de Aranzazu. The large crowd that march along with the Holy Wednesday and Good Friday processions of heirloom tableaus and images is a religious ritual from the past linking the history of the town to the Spanish colonial times. Historical accounts suggests that two years before Miguel Lopez de Legazpi claimed the City of Manila for Spain, his nephew, Juan de Salcedo came to present-day San Mateo with a force of 150 men and tag-along friars and established the first community in 1571. 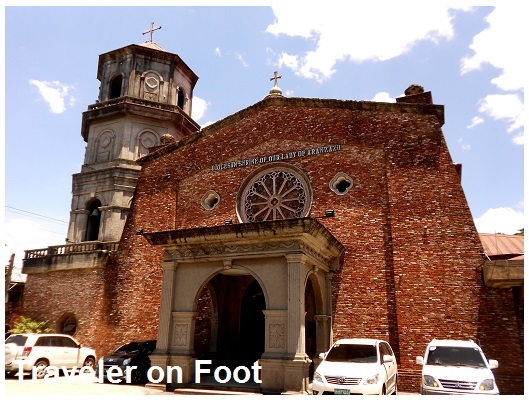 There is also another account describing the town was founded when the first chapel was built by the Augustinian along the riverbanks south of the present poblacion in 1596. To finally put the issue to rest, it has been suggested that the town was established in 1571 by Salcedo while the first church was founded in 1596 by the Augustinians. SHRINE OF THE NUESTRA SEÑORA DE ARANZAZU. The church of San Mateo has been dedicated to the Nuestra Señora de Aranzazu when the Jesuits took over the mission from the Augustinians in 1696. The Jesuit brought with them the image of Virgin Mary from the town of Aranzazu, Nueva Viscaya, Spain. The Jesuits built the first stone church in 1715 but was destroyed during the 1863 earthquake. In 1887, the church was rebuilt but was heavily damaged during the Japanese occupation in 1942. Major repairs took place in 1993 and the result is the church that we see today at the tip of the main road. HOW SAN MATEO GOT IT’S NAME. If San Mateo is not the patron saint of the town, why is then the town was named after him? As with many places in the Philippines, there is a folk tale to explain nearly how the town received its name. The usual story tells of a Spanish friar or soldier asking a local where he is. Due to the language barrier, the local describes something else. But this is not the case in San Mateo. According to one story, two Spanish scribes who came to the plains of San Mateo were charmed by the beautiful landscape that they have decided to establish a settlement. One of the scribes was standing on a mound with a book on one hand and a quill on the other. His posed caught the attention of his companion who described him to resemble the statue of Saint Matthew. In the midst of teasing and laughter, they decided to named the place San Mateo. 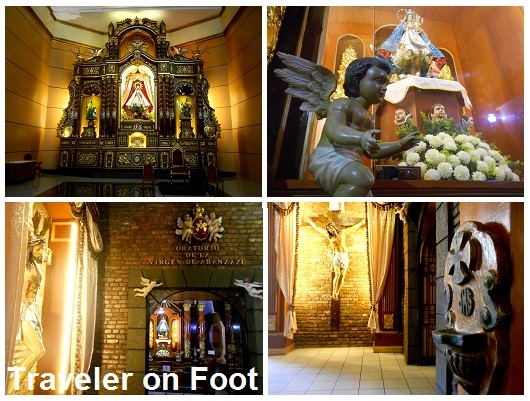 Visitors to San Mateo have two options which road to take upon reaching the Church of Nuestra Señora de Aranzazu. First, they could turn left and drive back to the National Capital Region. Second, they could turn right and continue the tour in Montalban, an equally remarkable town worth exploring. EULOGIO RODRIGUEZ ANCESTRAL HOUSE. San Mateo is one of the oldest settlements in the province of Rizal, to which at one time, the northern barangays of Balite, Burgos, Marang, and Calipahan belonged until 1871 when Governor General Rafael de Izquierdo separated the said barrios to form the town of Montalban. The town of Montalban was renamed recently after its most illustrious resident, Senate President Eulogio “Amang” Rodriguez. Amang as he is fondly called, has a life-long career as a public servant both for his hometown and as senate president. Although he has become an important political figure in local government and the Senate, Amang had humble beginnings as a farmer. As a famer, he built a house for his family near his farm. The huge track of land behind his old home has become part of a cemetery. The Rodriguez Ancestral House has been turned into a private museum showcasing the mementoes and collections of the longest serving senate president. Quartered in the ancestral house are vintage photographs, personal effects, commissioned furniture sets and paintings. We like that one particular painting near the staircase which depicts Amang as a young farmer. The stately bahay-na-bato has a cavernous silong that served as storage for the season’s harvest. Amang’s official vehicle while serving as Senate President, still bearing the plate number 3 is displayed in the silong near the zaguan. BATTLE OF SAN MATEO. A few walks across the Rodriguez Ancestral House is a statue dedicated to the hero of the victorious Battle of San Mateo. During the Philippine-American War, General Licerio Geronimo led a band of guerilla that defeated the Americans and killed the proud General Henry Lawton -the highest ranking American officer to have fallen in battle in either Spanish-American and Philippine-American Wars. General Lawton was the same officer who captured the elusive Indian rebel Geronimo. It was ironic that in the middle of his battles he met his death in the hands of a Filipino general bearing the same name of his former captive. But it is more ironic for Filipinos to have named a plaza and street in Manila and in Fort Bonifacio to the defeated American general while the heroic General Geronimo is remembered only with a single statue in an obscure location unnoticed, and overshadowed by a monstrous covered court. We feel that a lot needs to be arranged here. MONTALBAN GORGE. The colonial period was uneasy. Clashes with the Spanish colonial government were innumerable. During these tumultuous years, the townspeople would usually retreat to the mountains of Montalban which were relatively accessible from the lowlands. A year before the start of the 1896 Revolution, Andres Binofacio with eight men fled to the mountains of Montalban, to Pamitinan Cave on a Good Friday. Bonifacio inscribed on the cave wall what could have been the first cry of Philippine Independence. The cave wall still bears the inscription Viva la Independencia Filipinas! The Pamitinan cave is just one of the several cave systems in the Montalban gorge. Other caves are said to be where Japanese soldiers have retreated and spent their last defense during the final days of World War II. A marker by the cave entrance is visible from the trail. Guided tours to these historic sites are arranged at the Montalban Tourism Office. While Bonifacio and the Japanese who took refuge in caves found a sanctuary in the Montalban Gorge, the legendary Bernardo Carpio have to use his great strength in dealing with the curse of being trapped in two great rocks locally called as the naguumpugang bato to keep the mountains from crashing him down. WAWA DAM. One version of the legend revealed that the giant Bernardo was able to brake free by successfully pushing the mountains apart. Water gushed out from the other side of the mountain creating the river path known by this generation as the Marikina River. Below the narrow gap between the majestic limestone walls at foot of the mountains, Wawa Dam was constructed by the Americans in 1909 as the primary water source for Manila. 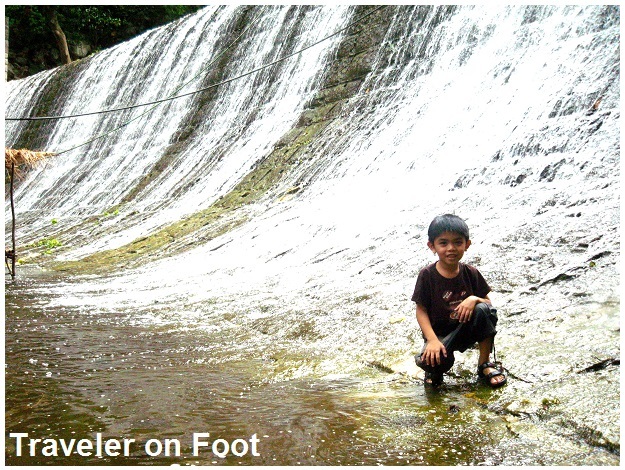 The dam ceased operation in the 1960’s when the Ipo-La Mesa-Angat watershed was established. Since its decommissioning, the dam’s lower river and upper lake were frequented by local tourists and campers for its breathtaking scenery and ethereal beauty. The volume of water pouring from the reservoir in the upper lake to the dam wall and the gurgling water around the primordial rock boulders sitting on the river provide a refreshing treat to the senses and to the spirit. But the dam is far from amusing. It has a grim history. The locals believe that its nangunguha, it summarily takes a human life. Its victims were usually first born males. Survivors claimed that a strong force was pulling them down while swimming even on shallow parts of the river. A local television documentary named the supernatural force as Pandora, a river fairy who has been raped by a mortal and has sought revenge by drowning her unsuspecting victims. AVILON ZOO. When in Montalban, one is close to nature. Where else can wildlife feel like they are at their natural habitat but in a place embraced by the mountains and surrounded by lush greenery. Perhaps this what inspired a hobbyist to put up the Avilon Montalban Zoological Park. So far, the zoo is the largest and the best maintained in the country. In Avilon’s 7.5 hectares, wild animals share sheltered space with rare fauna, including the short-snout tapir, Calamian deer, giant tortoise, Palawan mousedeer, the endangered civet cat and some hundred species of birds, hence the zoo has been named Avilon. We have been to Avilon Zoo several times and left fascinated with information about the animal kingdom. Our eyes have grown wide upon seeing a certain type of animal for the first time. We have burst into laughter when one of us imitates the peculiar wailing of a certain beast. EPILOGUE. In all these, we have been thankful for trips that taught us that What is man without beast? If all the beasts were gone, men would die from great loneliss of spirit…all things are connected (Chief Seathl). We found a historical marker stating that the house belonged to Montalban’s most illustrious resident. In fact, proud as they are of their town’s homegrown political figure, the people of Montalban renamed their town after the house’s original resident –Eulogio Rodriguez Sr.
Eulogio “Amang” Rodriguez has a life-long career as a public servant. He was elected Senate President from 1952 to 1963. Prior to being senator, Amang has held different appointed and elected positions in government as Mayor of Manila (1940), Secretary of Agriculture and Commerce (1934), Congressman of 2nd district of Rizal (1925, 1931, and 1935), representative of Nueva Viscaya (1924), Governor of Rizal (1916), and President of Montalban (1909). Although looked upon as an important political figure in the local government and in both Houses of Congress, Amang has humble beginnings as a farmer. Being a farmer, he preferred building the house for his family near his farm. While the huge track of land behind the old house is now part of a cemetery, the Rodriguez Ancestral House has been converted into a private museum showcasing mementoes and collections of the longest serving Senate President. During our unplanned visit to the Rodriguez Ancestral House, we met Jojo at silong who cordially led to what was then the second floor living quarters. Just as we expected based from the imposing exterior, the upper floor has an airy interior. Just like in most traditional bahay-na-bato, the sala occupy most part of the second floor. The sala is separated from the dining room and further beyond it is the kitchen which we were told is still being used on certain occasions. There were two bedrooms but it was off limits during our visit. Jojo told us that the interior is maaliwalas not only because of translucent capiz windows around the house but also due to the selected pieces furniture displayed in the spacious rooms. 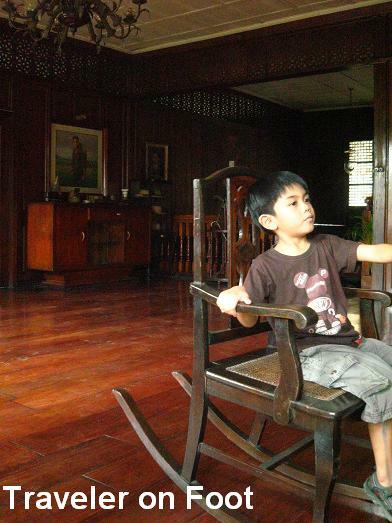 Jojo explained that most of the heirloom furniture has been distributed among Amang’s children and grandchildren. Those items selected for the exhibit however were mostly artifacts and memorabilia that inform visitors about Amang’s career as a public servant. The Rodriguez Musuem shares space with one of Amang’s grand children who held office as an elected government official at the entresuelo. According to Jojo, The upper floor is still used for caucuses and assemblies. There have been occassions when the museum artifacts are being rearranged or temporarily removed from the exhibit areas to avoid damage. On our visit, we viewed interesting museum pieces quartered in the house like the commissioned paintings and furniture sets, rare vintage photographs, and other personal effects including a collection of baston displayed in an antique bastonera and another set of canes encased in a glass drawer. The chairs and desk commissioned with official seal is the focal point of the sala. The senate president’s desk is recreated complete with tobacco boxes, inkwell, and a gavel. On our way out of the museum we passed by again the cavernous silong which served as a massive storeroom for the season’s harvest. Amang’s official vehicle while serving as Senate President, still bearing the plate number 3 is displayed in the silong near the zaguan. MONTALBAN GORGE. Wawa River cuts through the primeval rock after the thousand-year process of erosion to form the majestic limestone walls. 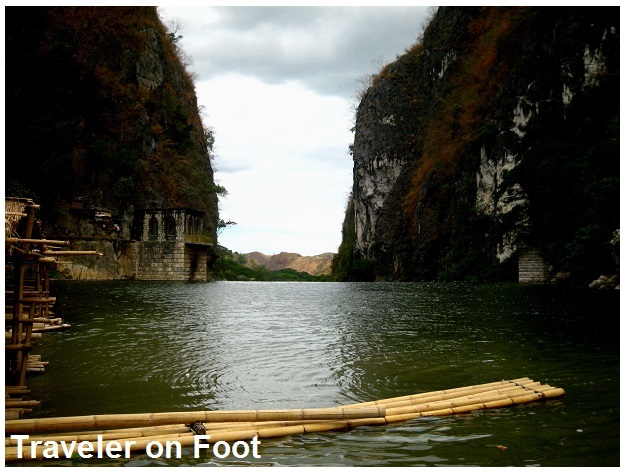 There is also the local folklore which tells that the Montalban Gorge was created by the mighty Bernardo Carpio. According to the legend, Bernardo was a love child of Infanta Jimena and Don Sancho Diaz. When the forbidden love affair between his sister Infanta and political rival Sancho was discovered by the King Alfonso, he ordered the imprisonment of Infanta and the murder of Sancho. The young Bernardo was able to escape the furious King Alfonso only to be discovered later. But the boy has grown as a giant. The cruel king wanted Bernardo to suffer the same fate as with his parents so he ordered a shaman to have him locked-up until he meets his death deep within the hallows of the mountain in Montalban. The shaman was able to lure Bernardo into the trap. It is said that whenever an earthquake occurs, it is caused by Bernardo trying to escape from the bowels of the mountain. NAUUMPUGANG BATO. A sequel to the legend revealed that Bernardo broke free by successfully pushing the grinding mountains of Pamitinan and Binacayan apart. Water gushed out from the other side of the mountain which formed the river channels of San Mateo and Marikina. Below the narrow gap between the amazing limestone mountains, Wawa Dam was constructed by the American in 1909 as the primary water source for Manila. WHERE THE ROAD ENDS, THE HIKING BEGINS. The trail to Wawa Dam involved walking on a rocky ascending trail with steep drop-offs on one side and bamboo and nipa houses on the other. 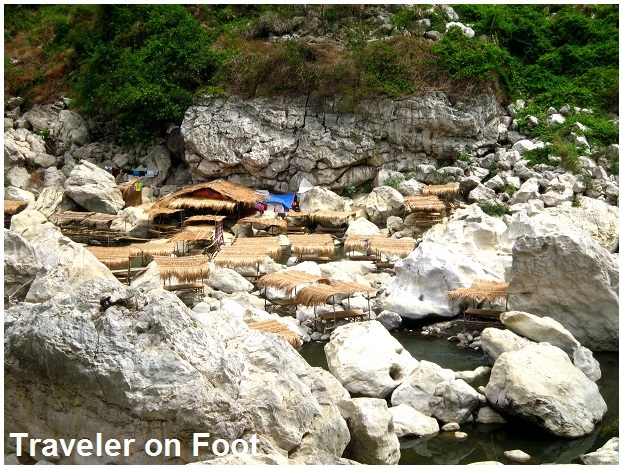 These dwellings along the sides of the trail made brisk business by selling turon and samalamig to hikers. As the winding mountain trail became narrower, we could see from one side the steep slope and the running river further enhanced by huge white boulders where the locals have built makeshift huts of bamboo and nipa that tourists and campers could use for a minimal rental fee. 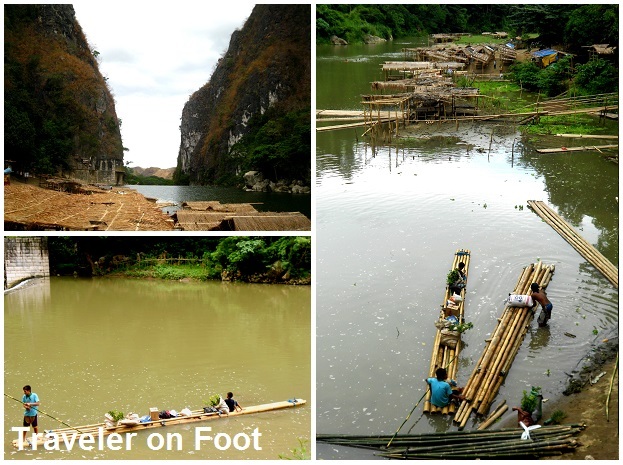 A few walks further, we had a view of the amazing Wawa Dam also with huts huddled close together at the foot of dam looking similar to the luncheon scene at Villa Escudero. OLD OBSERVATION DECK. On our way to the upper part of the dam, we walked through two tunnels carved out from the mountain’s limestone wall to reach the old observation deck. Here, we had spectacular views of the majestic gorge, the gorgeous upper river and the narrow chasm. The height of the deck from the lake below is a dizzying vertical drop but Howie Severino made history recently perhaps to be the first journalist and blogger to have jumped off from the deck’s ledge into the upper river. It may be a feat for Howie but for a group of local children, diving off from the observation deck is part of their swimming routine in Wawa Dam. WAWA RIVER. We crossed the iron bridge that connects the observation deck to the upper river. There were makeshift huts filled with families having picnic, friends exchanging stories, and even a group singing their hearts out around a videoke! We were so excited to take a plunge into the river but we realized that we did the most unforgivable thing we’ve ever done for this trip of forgetting our bathing suit or at least to bringing extra clothes. WAWA DAM. 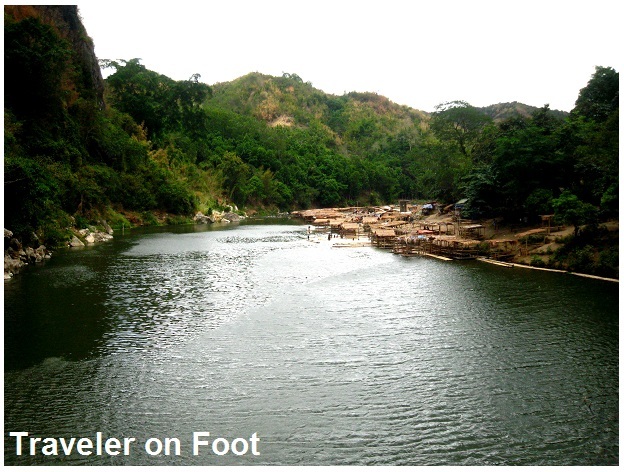 Wawa Dam ceased operation in the 1960’s when the Ipo-La Mesa-Angat watershed was established. Since its decommissioning, the dam’s lower river and upper lake were frequented by local tourists and campers for its ethereal beauty and extremely cheap almost free accommodation. During summer months, the dam’s spillway is converted into a picnic area much like a version of the popular luncheon scene at Villa Escudero. Although the trip down to the picnic site close to foot of the dam is arduous but it cost practically nothing to enjoy the man-made falls. The water pouring from the reservoir in the upper lake to the dam wall and the gurgling water around the primordial rock boulders on the river provide a refreshing treat to the senses and to the spirit. PAMITINAN CAVE. Tired and thirsty, we rested in one of the bamboo stalls selling sweet turon and ice-cold samalamig along the side of the trail. We asked the tindera about the Pamitinan Cave. She pointed at the limestone wall across her stall where two caves are visible from her stall’s window. A year before the start of the 1896 Revolution, Andres Bonifacio with eight men fled to the mountains of Montalaban, to Pamintinan Cave on a Good Friday. Bonifacio inscribed on the cave wall what could have been the first cry of Philippine Independence. According to the local tourism office, the cave wall still bears the inscription Viva la Independencia Filipinas! EPILOGUE. The Pamintinan Cave is just one of the several cave systems in the Montalban Gorge. Other caves are said to be where the Japanese soldiers have retreated and spent their last defense during the final days of World War II. A marker by the cave entrance is visible from the trail. Guided tours into the caves are arranged at the Montalban Tourism Office.